The mystery of the Most Holy Trinity is probably my favorite religious lesson to teach to the children. There are just so many excellent examples to help us understand this article of our Faith. St. Patrick used a shamrock. Others have used the example of the family. St. Anselm of Canterbury compared the Trinity to a spring, a stream and a lake and St. Bonaventure applied St. Augustine's three powers of the soul to the processions of the Holy Trinity. 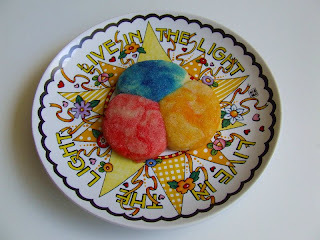 Today, we used some cookies to demonstrate in a very small and imperfect way the mystery of this doctrine to our children. 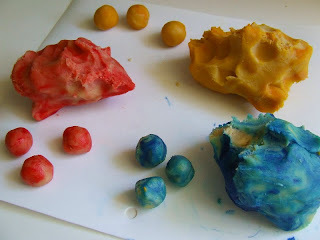 I divided some sugar cookie dough into three parts and colored them red for God the Holy Spirit, gold for God the Son, and blue for God the Father who made heaven and earth. (You could also use green, purple and gold.) The children shaped them into small balls and placed them on the cookie sheet. 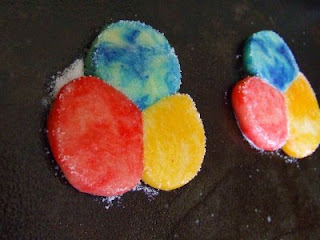 We flattened them with a sugared glass bottom so that they would cook evenly. Judging from the squishing noises being made, I think this was their favorite part! Another simple dessert for today would be a Rainbow Sherbet Cake. I once had a theology professor use Rainbow Sherbet as an analogy for the Triune God and while it might have been an imperfect analogy, it certainly made us sit up and listen. Very cute idea, Charlotte. And the kids had fun with it -- the best part!